Amazing, insane, beautiful: These are all adjectives that friends and acquaintances have used to describe my skin lately. Most of it is probably due to good habits (more about that in a later post) and good genes, but truthfully the right makeup products help too. Here's what I've been using and loving lately in a 5-minute morning routine that only requires 2 brushes. 1. The biggest change to my beauty routine recently has been switching to Estee Lauder Double Wear All-Day Glow BB Moisture Makeup SPF 30 ($45). This all-in-one wonder moisturizes, evens out skin tone, and offers sun protection. Best of all, the superfine colour pigments blend in seamlessly and provide a long-lasting, lit-from-within luminosity. I usually squeeze 3 dot-sized amounts—one for each cheek and my forehead—and blend with clean fingers. 2. After the BB cream, I brush Estee Lauder Double Wear Brush-On Glow BB Highlighter ($31) where needed: in the inner corners of my eyes and underneath, around my nose, above the cupid's bow, and on my chin where there's some ruddiness. The brush-tip click-pen makes it easy to dispense and apply just the right amount of product. 3. Using the brush included, I sweep Estee Lauder Bronze Goddess powder bronzer ($40) in a giant number 3 shape from my forehead to just under my cheekbones to my jaw, then sweep more along the jawline and toward my neck. 4. Cream blush creates a dewy, natural glow during the summer months when applied to the apples of the cheeks. I love Diorblush Cheek Creme which is sadly no longer available, but MAKE UP FOR EVER HD Blush ($31) works well too. Pro tip: In recent years, I've noticed more and more beauty brands launching limited edition cream blushes as part of their summer collections, so shop early in the season for the best selection. 5. 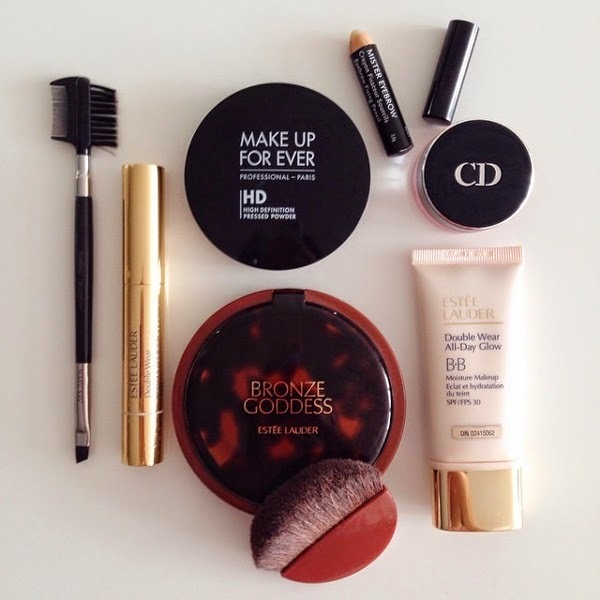 Using the bronzer brush, I set my makeup with a light dusting of MAKE UP FOR EVER HD Pressed Powder ($41), which diminishes the sticky, tacky texture of the cream formulas while blurring lines and imperfections. A little goes a long way! 6. Lastly, I brush my brows in an upward motion with Mary Kay's Eyeliner/Eyebrow Brush ($12) and fix them in place with a few swipes of Givenchy Mister Eyebrow-Fixing Pencil ($26). You can see by how stubby the pencil is that it's well-used and much-loved! Two products are noticeably absent from this routine: my mascara and lash curler. Between allergies and lots of computer time lately, my eyes have simply been too sensitive. As it turns out though, eschewing mascara is crucial to nailing the "no makeup" aspect of this look. Curled, mascara-brittle lashes look too "done" and are a dead giveaway that you're wearing makeup; skip it and people will attribute your flawless glow to you instead of your foundation. I haven't tried the Estee Lauder BB, but I do love their double wear light. The BB's wonderful! Can't recommend enough. You're too sweet, Lar! Skin compliments always make me feel like a bit of a fraud, I have to admit; I don't have naturally good skin and I have to work at it. One of these days I'll do a post about the other stuff I do to maintain a good complexion.